MEXICO CITY (AP) — Mexican archaeologists said Monday they have found a cave at the Mayan ruins of Chichen Itza with offerings of about 200 ceramic vessels in nearly untouched condition. HILO, Hawaii (AP) — Officials say they plan to reopen a popular cave-like attraction in Hawaii Volcanoes National Park later this year. CANBERRA, Australia (AP) — Two amateur divers who canceled their vacation plans to join what they thought was a hopeless mission to rescue 12 boys and their soccer coach from a flooded cave in Thailand received one of Australia's most prestigious awards on Friday. President Donald Trump's decision to postpone his State of the Union address under pressure from House Speaker Nancy Pelosi surprised allies, contradicted top aides who had been working on an alternative speech plan and left all of Washington trying to determine whether it signaled new willingness by Trump to make a deal to reopen the government. PHILADELPHIA (AP) — Authorities say a busy intersection in Philadelphia's Center City has been closed due to what is being described as a large cave-in. Officials told WTXF-TV that they believe the sewer collapsed at the intersection of 20th and Chestnut streets, and it's not believed to be weather-related. The Philadelphia Water Department says it will have crews on the site Tuesday to make a preliminary assessment of work that needs to be done. OZARK, Mo. (AP) — Deep inside Smallin Civil War Cave, Rick Mansfield stood next to the very spot where famed Ozarks explorer Henry Rowe Schoolcraft stood 200 years ago. In the dim light, Schoolcraft — age 25 at the time — noted the two pools of water flowing along the sides of a massive rimstone formation. An amateur geologist, Schoolcraft wanted to linger and see more of the huge cave, but his guide urged him to press on to try to locate lead deposits in the area. SPRINGFIELD, Ill. (AP) — Gov. Bruce Rauner has signed legislation that gives the Illinois Department of Corrections authority to sell the closed Hardin County Work Camp to Hardin County for $1. COUNCIL BLUFFS, Iowa (AP) — A man has been sentenced to 10 years in prison for stealing copper wire in western Iowa that was soon tracked to his Nebraska home. LONDON (AP) — British divers who rescued young soccer players trapped in a flooded cave in Thailand are among those being recognized in Britain's New Year's Honors List, along with 1960s model Twiggy and Monty Python star Michael Palin. LOUISVILLE, Ky. (AP) — Mammoth Cave National Park in Edmonson County will remain partially open to the public during the partial shutdown of the federal government. As similar to other national parks across the country, Mammoth Cave National Park will be accessible to visitors but emergency and rescue services will be limited. This includes no tours and no access to the cave without a guided tour. Picnic area, restrooms and other services that require staffing will also not be operating. MAMMOTH CAVE NATIONAL PARK, Ky. (AP) — Scientists at Mammoth Cave National Park are taking part in two studies regarding white-nose syndrome, or WNS. WNS is caused by a fungus growing on bats' muzzles, wings and tails and while it is not harmful to humans, it is known to have killed millions of bats across the country. SPRINGFIELD, Ill. (AP) — The Illinois Senate has approved a plan to sell a shuttered prison work camp to local officials. The Hardin County Work Camp in Cave in Rock once held 200 minimum-security prisoners. It was closed in August 2015 for budgetary reasons. Wearing red-and-white United scarves and with a look of excitement on their faces, the boys from the Wild Boars team took their seats in the directors' box for the game. ST. PAUL, Minn. (AP) — St. Paul authorities are again warning people to stay away from the city's caves by the Mississippi River. Crews were called to rescue two teenagers who were seen entering a hole leading to the caves Friday afternoon. St. Paul Assistant Fire Chief Mike Gaede says the teens emerged by themselves and were not hurt. BANGKOK (AP) — The 12 village boys who were trapped with their soccer coach in a flooded cave in northern Thailand for almost three weeks are ready to spread their wings, heading out to meet fellow youth players in Argentina and do a brief tour of the United States. KISSEE MILLS, Mo. 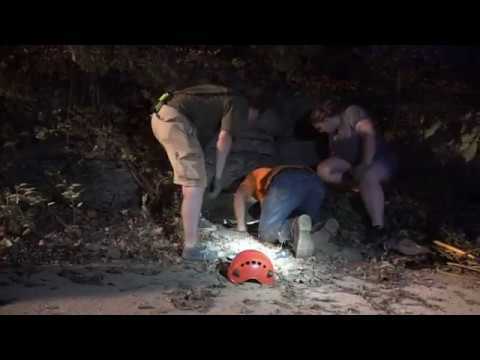 (AP) — A man was rescued after being stuck in a cave in Taney County. KOLR-10 reports that Central Taney County Fire District Training Officer Jeff Romines says that three men were in a cave on Tuesday near Devil's Tea Table Road when one became too tired to get out. He says the men were about 30 feet (9.14 meters) into the cave. Romines says two men stayed to help keep the stuck man calm. CUSTER, S.D. (AP) — The National Park Service is suspending guided tours at Jewel Cave National Monument in southwestern South Dakota to make improvements along the half-mile long scenic route. Tours will be shut down from mid-October until about April, as workers upgrade structures built in the late 1960s and early 1970s, including sidewalks, stairs, guardrails, handrails and lights. CAVE-IN-ROCK, Ill. (AP) — An Ohio River ferry between Illinois and Kentucky will resume full service Monday after operating on limited hours the past three months. EL MALPAIS NATIONAL MONUMENT, N.M. (AP) — Test results indicate the presence of a fungus that has been linked to a disease lethal to bats in cave soil at El Malpais National Monument. Officials at the monument said Tuesday tests done by an Arizona laboratory turned up low levels of the fungus that causes white nose syndrome, which has resulted in the deaths of millions of bats in other states. BOISE, Idaho (AP) — The University of Idaho and U.S. Forest Service's Boise National Forest say they've identified human remains from Native Americans in their holdings that will be turned over to present-day tribes. NEW YORK (AP) — It looks a bit like a hashtag, but it's 73,000 years old. And scientists say this tiny sketch found in a South African cave is the oldest known drawing. BANGKOK (AP) — It was show time Thursday for the 12 boys and their 25-year-old soccer coach who were trapped for almost three weeks in a flooded cave in northern Thailand as they spoke at a public exhibition in one of Bangkok's largest malls. CAVE CITY, Ky. (AP) — Mammoth Cave National Park has reopened Nolin River for paddle boats, but with a warning that the waterway can be unpredictable. Mammoth Cave National Park management analyst Molly Schroer tells the Daily News officials are calling it "a wild and dynamic river" that's not the best option for novice paddlers. AMERICAN FORK, Utah (AP) — A Utah family hopes a billboard on Interstate 15 will bring new information about the disappearance of a 24-year-old woman missing since she went running at Timpanogos Cave National Monument more than six months ago. The Utah County sheriff's office says Jerika Binks left most of her belongings Feb. 18 in her room at a residential treatment center in American Fork, but took her cellphone with her. ARLINGTON, Texas (AP) — Jake Cave watched Mitch Garver wipe out what was left of Minnesota's six-run deficit with a bases-clearing double. Then the rookie put the Twins in front to match the club's highest-scoring inning of the season. Cave hit a tiebreaking homer right after Garver's three-run double in an eight-run fifth, sending the Minnesota Twins to a 10-7 victory over the Texas Rangers on Friday night.